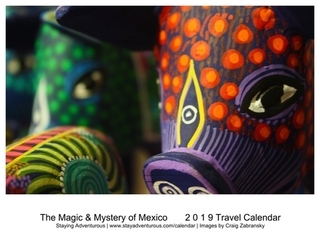 Even as Cancun and the Riviera Maya continue to develop and grow, visitors can still find some places off the main commercialized tourist trail without going south of Tulum. 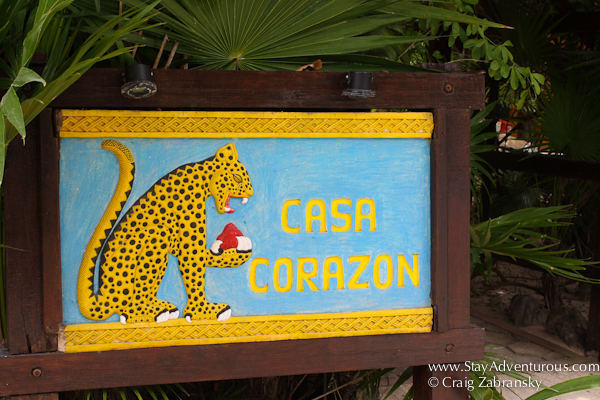 One such place is Casa de Corazon in Soliman Bay. 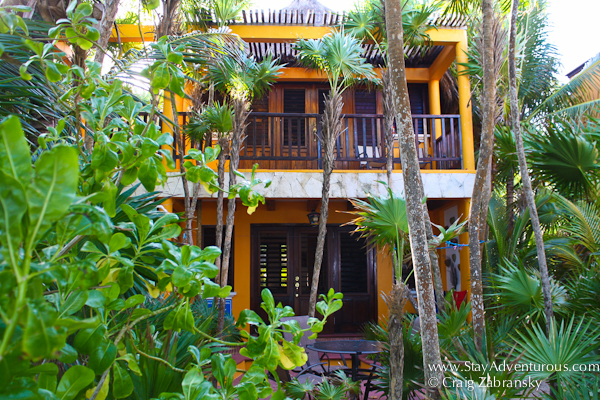 When returning to Riviera Maya I asked mi amiga Kay from LocoGringo.com about places to stay that weren’t a typical resort. I thirsted for something different and she steered me in the direction of Soliman Bay. Casa de Corazon, touched my heart and quenched my thirst. The collection of bungalows served as the perfect place to disconnect (even though it had arguably the best Wi-Fi connection in my experience in the Riviera Maya), relax and enjoy the impressive natural surroundings this part of the world offers its visitors. 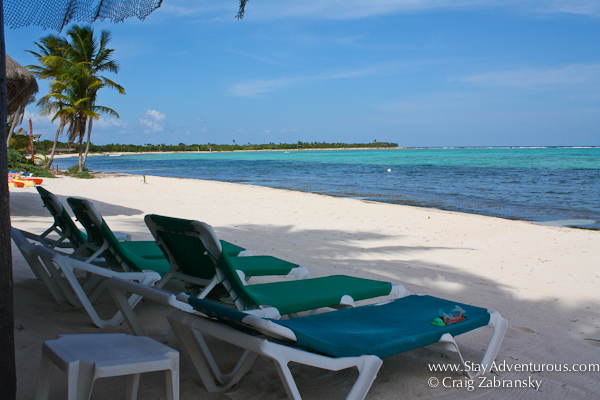 Even though I’ve traveled to Mexico and the Riviera Maya quite often over the last few years, I hadn’t heard of (or traveled to) Soliman Bay. But surprisingly, the Bay, located 15 minutes north of Tulum (& 90 minutes south of Cancun), can be found just off the main coastal highway. Getting there along a road that offshoots from the highway, you will see a few small boutique hotels, casitas and bungalows but no big resorts, no chains, no commercialization. 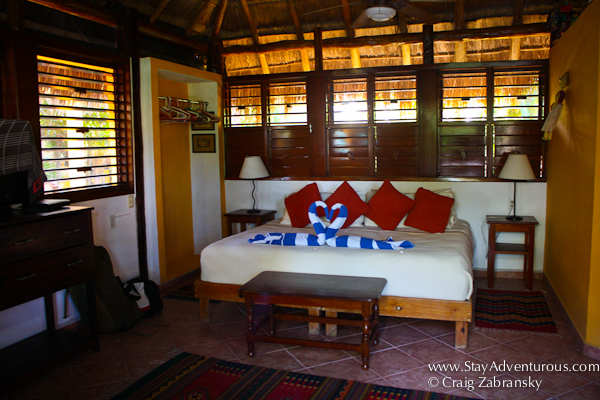 Casa de Corazon Bungalow #2 was my home away from home while staying on the Bay. Just a few yards from the beach, the bungalow had a kitchen and dining area on the bottom and a bedroom (a queen and a single) on the second floor. 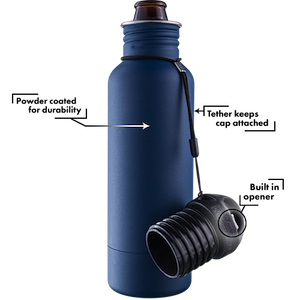 This design was perfect. It captured the nightly breeze & provided for very comfortable sleeping (no A/C needed, only fans). Having all the food on the main level with a full kitchen made it easy and inspiring to cook while keeping all the food neatly away from the bedroom. The view of the two story bungalow from the beach. The full kitchen and dining area. Plus, from the second floor, one could not just hear the ocean, but also see it through a few yards of lush tropical jungle. Although admittedly I spent many hours in the hammocks provided on the beach, I remained most impressed with the seal life present in the bay. No, not nightlife Cancun style, but a protected area teeming with interesting creatures. Whether walking along the beach, swimming, snorkeling or kayaking (Casa de Corazon provides sea kayaks and snorkel gear for its guests to use), I was able to see live conch in shells of all sizes, different species of fish, and colorful crabs. 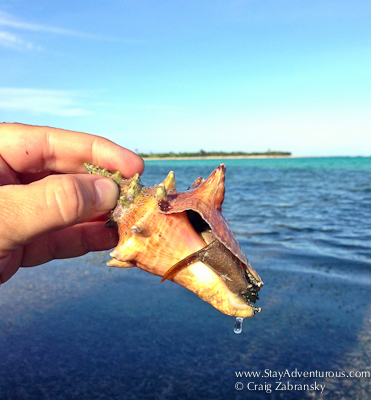 I had never picked up a live conch from the sea before but did so (and placed it gently back) while at Soliman Bay. The birds were equally as fun to observe, especially the pelicans, who would spear fish with their beaks just a few feet from my footprints in the sand. A conch from the seashore. Time on the hammock in the morning with coffee. The beach itself may not at first appear as “clean” as Tulum’s, but that is only because of a natural seaweed bed. Once you get out past it, you’ll see loads of fish in the crystal clear Caribbean sea. As if the time to recharge and relax away from any hectic schedule isn’t enough a blessing for most of us, the resort caretakers (Gadi and Jorge) deliver an urn of burning copal into each bungalow nightly. The Mayan used Copal to help cleanse and refresh the soul. This added touch truly reminds you that you are in the land of the Maya, and the convenient location offers access to experience and explore this great civilization too. For my soon-to-be-released podcast, I spoke with the owner of Casa de Corazon from the hammocks one afternoon during my stay. He mentioned 2 things that are a must-do in the region: 1) visit a local Mayan ruins site and 2) swim in a local cenote. I completely agree. The pool is small, but refreshing. 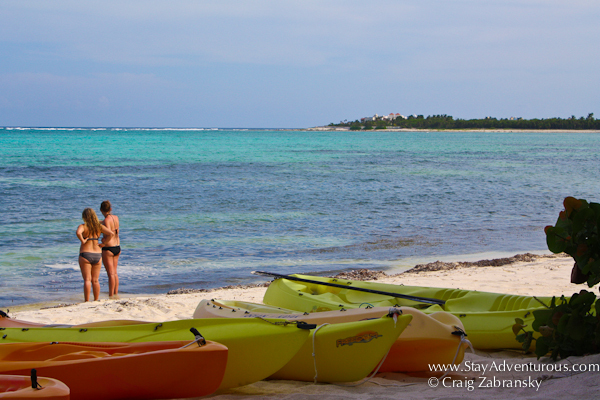 Okay, you don’t need a car to get to Soliman Bay, but it really makes getting there easier if you have one. As a visitor, you will also want to explore the local Mayan ruins and cenotes and spend time in nearby Tulum. A car may seem to add to the cost of your holiday but remember the full kitchen in the bungalow will offset meal cost. This is a holiday and having your own transportation makes the location more convenient and don’t worry, the single highway is safe and easy to navigate. If you still want to brave the bungalow without a car, keep in mind it is a long walk to the main road (longer in the heat of day and even longer with suitcases) and it can be a long wait for los collectivos (buses). 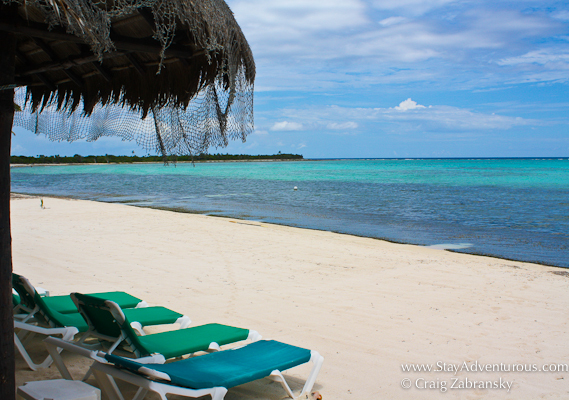 Perfect for R&R in the Riviera Maya of Mexico. I spent 4 nights at Casa de Corazon, but the bungalows are priced by the week and I recommend staying at least that long. Low season (summer)weeks are $950 USD, but the rate will be $2,300 USD over the Christmas Holiday. The bungalows are not designed for solo travelers but larger groups and families; visitors don’t pay per person. 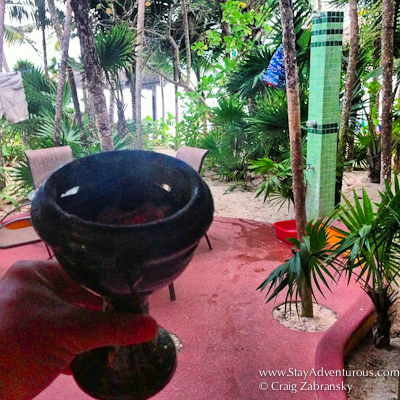 Yes, it may seem a bit more of an “adventurous” option than the typical resort with services and amenities, but Casa de Corazon is perfect for people looking for a quiet place (remember there is no nightlife in Soliman Bay) that want access to nature, and a peaceful existence along the Caribbean Sea. Also, it is remains close to trendy Tulum and provides easy access to explore Mayan ruins and cenotes. I spent 4 nights at the Bungalow under a discounted press rate, but as always the opinions are uniquely my own. Impressive. It looked like a fun four days. The bungalow looks so inviting. ohhh i like the look of that bungalow. 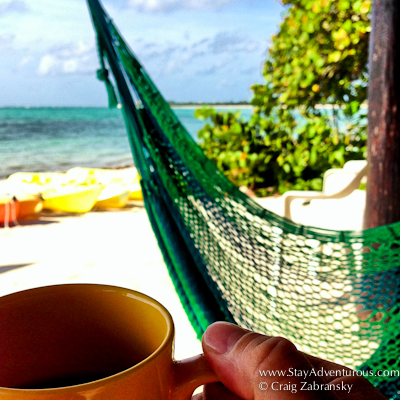 alsooo, wouldnt mind having our morning coffee on those hammocks… xo! 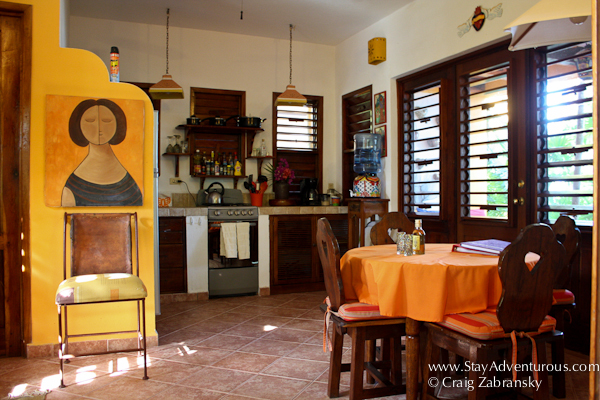 Hotels in Mexico are among my favorites – totally dig that style of decorating. That bungalow looks pretty sweet! 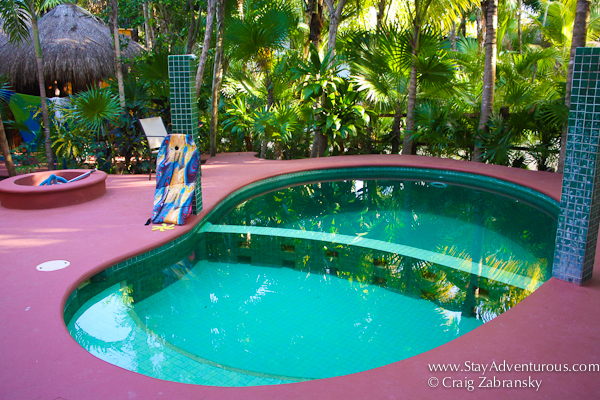 Looks like a fantastic place to stay in the Riviera Maya. Great that it is accessible to all sorts of adventure including cenotes, kayaking, live conch shells, and Mayan ruins. I am sold. Another beautiful beach and lovely quiet place to stay and relax. Okay, that two story bungalow has our names written all over it. Plus, how adorable is that kitchen?? I’m kind of obsess with that old school stove. Haha.. looks like a nice and relaxing stay.